Place chicken in large food-storage plastic bag. 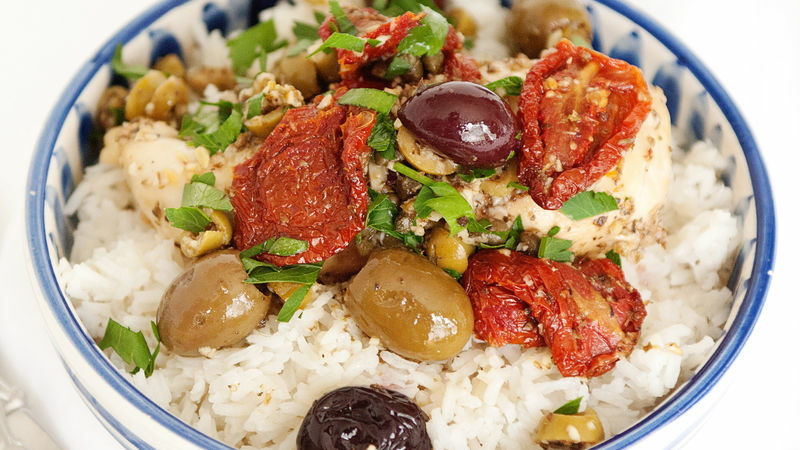 In medium bowl, stir together tomatoes, olives, oil, vinegar, capers with juice, oregano, pepper, garlic and bay leaves. Pour over chicken in bag. Refrigerate at least 8 hours or overnight to marinate. Heat oven to 350°F. Remove chicken from bag; place chicken in single layer in ungreased 13x9-inch (3-quart) glass baking dish. Pour marinade from bag over chicken. Sprinkle with brown sugar; pour wine over chicken. Bake 45 to 60 minutes, basting every 15 minutes with cooking liquid, until juice of chicken is clear when center of thickest part is cut (at least 165°F). Remove and discard bay leaves. Serve chicken mixture over rice; sprinkle with parsley. This recipe can be doubled or tripled to feed a large crowd.